Just a few information about the new game system from Nintendo. The official page is under www.ique.com. 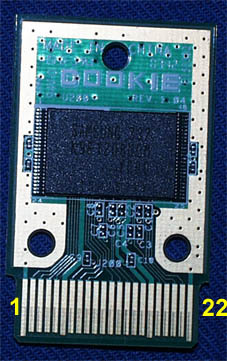 The cartridge consists of one SAMSUNG flash chip K9F1208U0M-YCB0 with a 22 pin cartridge connector. A link for an iQue flash cartridge programmer using a Cypress USB FX2 board is here. There are a four capacitors around the flash chip (think 100n), one between pin 6 (Vcc) and the ground plane (very close to the connector) and one between GND1 and Vcc1 in order to perform an automatic reset function. Inside the iQue is a big NEC custom chip, with the cpu and the other glue logic inside. The SRAM chip K4D263238E-GC33 is also from SAMSUNG .